﻿• “Art as Activism 2015,” presented by the University of Texas at Austin's Gender and Sexuality Center at the Student Activity Center's Black Box Theater: March 10, 2015. 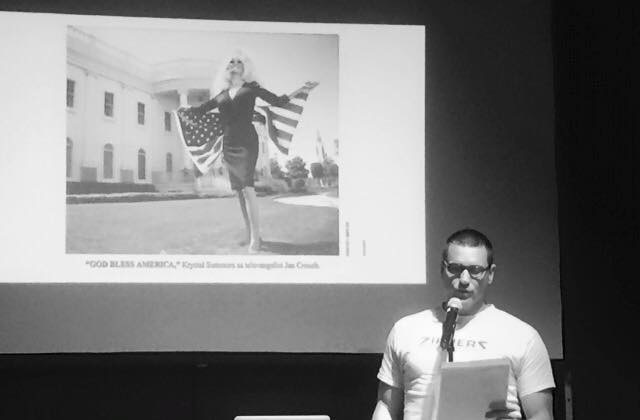 • “214 Trans4m + JFK50,” a multimedia discussion at the Dallas Public Library: Nov 21, 2013. • Art Con 9: Nov. 19, 2013. • University of Texas at Dallas CentralTrak: June 1-Aug 31, 2013. • CentralTrak-Next Topic, “That Mortal Coil: Rebuking the Ideal in Contemporary Figurative Art” lecture series: June 27, 2013. • Art Con 8: Nov. 11, 2012. • Kessler X+ Gallery: April 18-May 20, 2012. • RZN8 at Life in Deep Ellum Gallery: Aug. 25, 2012. • Art Con 7: Nov. 15, 2011. THE KESSLER BROUGHT US TOGETHER: Amy Sedaris pinches my shoulder as I fondle her slender waistline. (Photo: Dylan Hollingsworth).